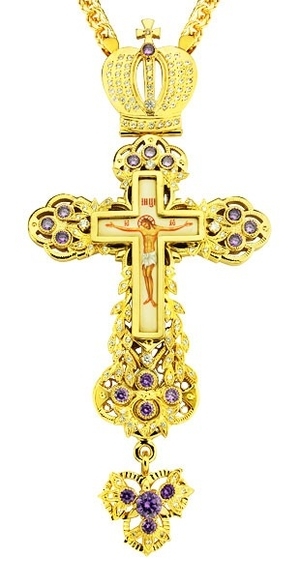 Pectoral cross - A6 (with chain) - Istok Church Supplies Corp.
A very nice and comfortable in wearing Orthodox Christian clergy pectoral cross of medium size is made of brass and covered with high-quality gold-gilding. A multitude of phianite stones of excellent quality along the entire front wall of the cross makes it very elegant thanks to the flickering of the stones. They are attached manually, so problems with their falling out during wearing is completely excluded. There is a matching panagia for this cross with SKU PGA-0078LP-2.